The Hong Kong Tourism Board is staging the biggest edition of Hong Kong Wine & Dine Festival this year, with a bigger venue and higher participating exhibitor numbers, as the festival celebrates its 10th anniversary. The 10th edition of the Hong Kong Wine & Dine Festival is set to be the largest edition ever. 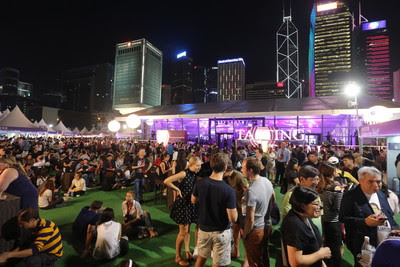 Scheduled from 25 to 28 October, the four-day festival will extend its space from Central Harbourfront Event Space to Tamar Park in Admiralty, 20% larger compared with last year’s venue size, while there will also be about 450 booths serving fine wines and food, up 10% from last year. To celebrate the 10th anniversary, the event will unveil a special wine commemorative series called “2009 vintage,” marking the inaugural year of the Wine & Dine Festival. There will also be special editions of beers and Baileys designed for the 10-year anniversary on offer at the fair. In addition, a diverse collection of wine, craft beer, whisky and Japanese wines will be showcased at the fair. Another highlight is the‘10-Michelin-starred Dinner’ where five Michelin-starred chefs from mainland China, Hong Kong, Taiwan, Bangkok and Singapore are coming to Hong Kong to jointly present the ’10-Michelin-starred Dinner’ in the Tasting Room section. The five visiting chefs, who have been awarded a total of 8 Michelin stars, will collaborate with two renowned Hong Kong chefs from one-Michelin-starred restaurants, Man Wah and Mandarin Grill + Bar, to concoct a wine pairing banquet with eight courses, fusing Chinese, Thai and French elements. The five visiting celebrity chefs are French Chef Pierre Gagnaire of “Pierre”, a two-Michelin-starred restaurant in the Mandarin Oriental Hotel Hong Kong; Chef Bee Satongun of Paste Bangkok, a one-Michelin-starred restaurant in Bangkok. She was also named Asia’s Best Female Chef 2018 by Asia’s 50 Best Restaurants; Chef Lin Cheng Ching, Chinese executive chef of The Guest House, a two-Michelin-starred restaurant in Taiwan; Chef Kentaro Chen, executive chef of Shisen Hanten, a two-Michelin-starred restaurant in Singapore; and Chef George Chen of Wujie, a one-Michelin-starred restaurant in The Bund, Shanghai.